Forbes recently released its annual list of the NBA's Most Valuable Teams. The headlines jumping out from the list are that the New York Knicks have overtaken the Los Angeles Lakers for the number one spot, valued at $655 million and $643 million, respectively, and that LeBron James taking his talents to South Beach has given his new team the Miami Heat the largest increase and his former team the Cleveland Cavaliers the largest decrease. The Heat are now in seventh place, valued at $425 million, up by 17 percent from last year. The Cavaliers are valued at $355 million, a whopping 26 percent drop in one year, essentially having lost one-fourth of their value. Guess we know why Dan Gilbert was so angry last summer--he knew his pockets would soon get a lot lighter. The Charlotte Bobcats rank about where they usually are on the list, at 25th with a value of $281 million. That's a 1 percent increase from last year and that's even more of a positive when you consider that 11 of the NBA's 30 franchises saw their values decline. Coming in slightly short of being a statistical tie with the Bobcats is Charlotte's former team, the New Orleans Hornets. The Hornets are ranked 26th, valued at $280 million, and saw a 5 percent increase. Team owner Michael Jordan speaking at the Bobcats Town Hall Meeting last fall. Photo from Bobcats.com. 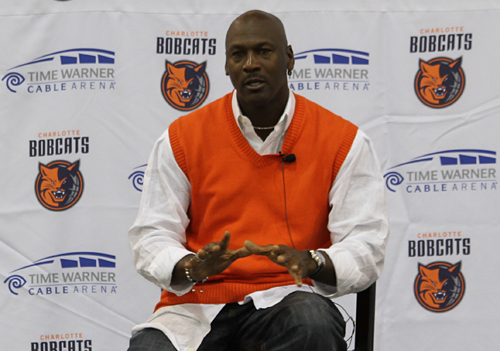 The Bobcats' value of $281 million is only a little more than the $275 million Michael Jordan reportedly purchased the team for last year. But it should be noted that in describing how it determines team values, Forbes states that "our valuations sometimes differ from the amount teams have recently sold for. Our estimations are based on the team’s current economics (unless ground has been broken for a new building) and do not include the value of real estate." If you consider real estate regarding the Bobcats, the city of Charlotte owns Time Warner Cable Arena, which opened in Uptown in 2005, but the team operates and maintains the building and receives most of the revenue. This is why professional sports franchises usually covet publicly financed arenas and stadiums, though it can often be a tough sell to the public and politicians, which is why the Hornets left Charlotte, when the city wouldn't build them a new arena in the early 2000s. I predict the Bobcats' value will increase by more when next year's list comes out. The franchise seems to be on the upswing in securing corporate sponsorships, such as its announcement earlier this month that the team had added Duke Energy as a new sponsor. Many analysts attribute Jordan's star power--number 23 still lights up a room and you'd be surprised how many CEOs want to be next to him. For the complete list of NBA team values, according to Forbes, click here.